Immigrant children are shown outside a former Job Corps site that now houses them, June 18, 2018, in Homestead, Florida. "Indian Country remembers," Mark Trahant, editor of Indian Country Today wrote in Monday's edition of the pan-Native news site. "This is not the first administration to order the forced separation of families." He later told VOA, "I basically wanted to show the recurring nature of history. It's a story so familiar." 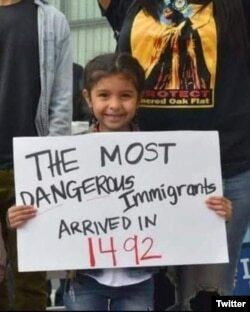 President Donald Trump's "zero tolerance" immigration policy has separated nearly 2,000 youths from their parents since April, triggering outcry from many Native Americans who find parallels in their own history with the U.S. government. 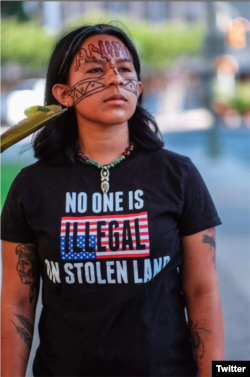 Native Americans on social media are sharing immigration-themed meme pictures across the internet, protesting U.S. President Donald Trump's immigration policies. "Most [non-Native] Americans do not know their own history, partly because any history that was embarrassing was not taught in school," said Oglala Lakota journalist Tim Giago, editor of Native Sun News Today. "Native Americans were taken from their parents starting in the late 1800s and shipped to places like Carlisle, PA and Genoa, Neb. to Indian boarding schoolos. We are still suffering from the trauma it caused." "Many Indigenous people are praying for the [detained undocumented] children to be reunited with their families and for the United States to do the right thing," Waln said. "But we know from experience that this might not happen." O.J. Semans, a Rosebud Sioux tribe member and executive director of South Dakota-based voting-rights group Four Directions, echoed Waln's comment, remembering another government policy which encouraged placement of Native American children in non-Native foster families. "In the 1970s, we had 25 to 35 percent of tribal children ripped away from their families. 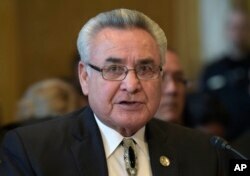 It took until 1978 to get Congress to create a law, the Indian Child Welfare Act, to curtail the abductions," he said, predicting that the current policy of separating migrant and refugee children from their parents will leave lasting scars. "The trauma of children being ripped away from their parents -- the only true love they have -- will haunt their dreams and memories till the day they die," Semans said. "I just can't imagine my children being taken away and not knowing if I will ever see them again," said a member of the Kickapoo Tribe in Kansas, who asked that her name not be used. She said she believes the policy is racist: "Do you think we'll see this happening to Canadians illegally crossing the border? No!" But not all Native Americans oppose Trump's policy. 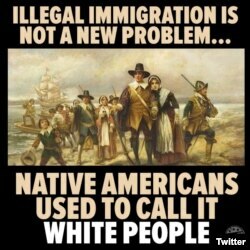 "I think we as a government have the right to detain anyone who comes here illegally," said Rick Cuevas, a disenrolled member of the Pechanga Band of Luiseño Mission Indians in California and author of the Original Pechanga blog. "And those who are going after the Trump administration now were the same ones protecting Barack Obama as he was separating children from parents. His policies allowed 50,000 unaccompanied minors into the country," he added. 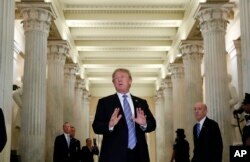 Trump has blamed Democrats for the current policy, announced in April, citing a “horrible" laws that call for children of families attempting to illegally cross the U.S. border to be taken from their parents. The Department of Homeland Security (DHS) says it has no policy on separation, but that children and parents may be separated in situations in which “DHS cannot ascertain the parental relationship, when DHS determines that a child may be at risk with the presumed parent or legal guardian, or if a parent or legal guardian is referred for criminal prosecution, including for illegal entry."